L 32″ (81 cm) W 50″ (127 cm). Description: Sexes similar. 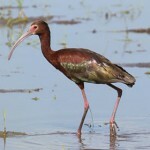 Adult has pink body with red highlights; long, spatulate bill; unfeathered greenish head. Immature similar to adult, but lacks red highlights and may have white feathers on head. Where in Nebraska: Rare casual visitor in south-central and southeast Nebraska. Fairly common along Gulf coast. 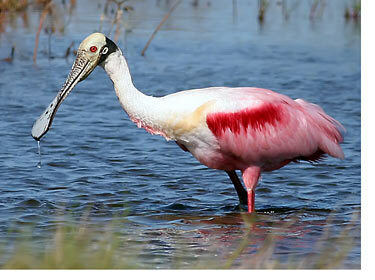 In Nebraska, look for the Roseate Soonbill in groups of other herons feeding in shallow water. 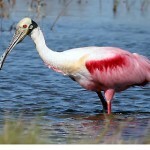 Fun Facts: Roseate Spoonbill get their pink color from the food they consume, small crustaceans that have fed on algae. Often grunts when hunting for food.